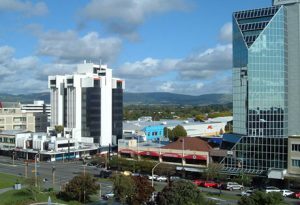 Kiwis could be fined up to $7,000 just for mentioning Palmerston North. New Zealand will tomorrow begin its traditional process of hiding the city of Palmerston North in advance of a royal visit. On Sunday, Prince Harry, Duke of Sussex, will arrive in New Zealand with his newlywed wife Meghan Markle, who is by an incredible coincidence the Duchess of Sussex. A number of preparations have been made for the visit, but the final touch will begin tomorrow, when a large grass-coloured tarpaulin is slowly pulled over the city. The tradition of hiding Palmerston North from the Royal Family – none of whom have any idea it exists – began in 1920 with the visit of King George V’s son, Prince Edward of Wales. The Government at the time determined it would be far too risky to allow the Prince to see Palmerston North, and so made an elaborate series of excuses to make sure he never found it. It’s unclear whether the deception was intended to be permanent, but the lie has been running for so long now – and the consequences of the royals finding Palmerston North ever-greater with time – that the easiest thing to do has been to just keep it up. Any references to the city on state highway signage have been scrubbed, Harry and Meghan will be provided with maps that fail to mention it, and all roads in and out of Palmerston North will have walls erected featuring Coyote and Road Runner style paintings to nowhere. Palmerston North MP Iain Lees-Galloway has been locked in a cupboard. Prime Minister Jacinda Ardern has informed New Zealanders that, if in the unfortunate event the royal couple do stumble upon the city, we are all to act as shocked and appalled as they are.